Saddle up! The Rocky Mountain Regional Rodeo is prepared to open the gate for their 35th annual event. Put on by the Colorado Gay Rodeo Association (CGRA), the rodeo takes place every year, drawing hundreds of contestants to take part in a large number of different events. This year the rodeo is set to take place on July 7-9 at the Jefferson County Fairgrounds just west of Denver, Colorado. If you’ve never seen a gay rodeo or taken part in one, it is definitely an event not to be missed. There will be many traditional rodeo contests, including roping skills, bull riding and chute dogging. 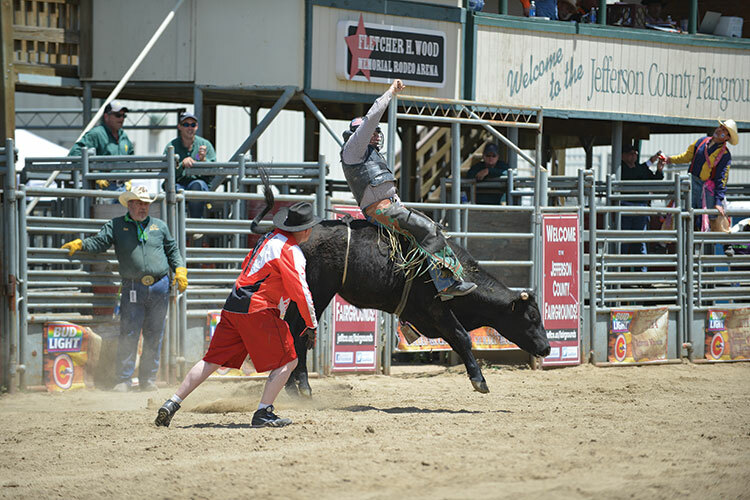 Chute dogging is where the rider is strapped on the back of a steer in a small, confined chute before it is released; then the rider has to remain on the steer for as long as possible. In addition to traditional rodeo events there will be some excellent events that are more unique to Gay Rodeo, including a Wild Drag Race and the infamous Goat Dressing where the contestants are tasked with putting underwear on a goat! The Rocky Mountain Regional Rodeo is the flagship event for CGRA. A member of the International Gay Rodeo Association (IGRA), CGRA was formed in September 1981 by a group of gay men who had a strong interest in Country-Western dance and culture. Gay country-western really started to become popular around this time in the United States with gay country bars popping up all across the nation. A gay rodeo set to take place in Reno, Nevada in 1981 inspired this small group to attend the rodeo and find out what it was all about. They found the experience overwhelming! They said groups from all over the country come together for square dancing, clogging, line dancing, rodeo and a royalty pageant for Miss National Gay Rodeo. Most importantly, this group of Denver cowboys saw the level of community togetherness and empowerment the rodeo brought to the LGBTQ community in Reno and beyond. That power to build a strong sense of unity and community inspired the group to start the Colorado Gay Rodeo Association, beginning with a goal of bringing a large group to the Reno Rodeo for the next year. At the 1982 Reno Rodeo and the first official year for CGRA, Colorado had over 400 participants wearing shirts bearing the slogan, “Colorado Rides with Pride.” The contingent made up over two-thirds of the total rodeo participants. Upon returning to Colorado, CGRA set its focus on the next challenge for the organization; bringing the rodeo to Denver. Today we continue to honor and celebrate this 35-year legacy of the Rocky Mountain Regional Rodeo. CGRA hosts a variety of events and fundraisers to support various charity and non-profit organizations throughout the Rocky Mountain Region. From the rodeo, itself to the Mr. and Mrs. CGRA pageant, dance competitions, drag shows, beer busts and much more, the members’ active involvement within the local community makes the CGRA a leader in and a champion for the LGBTQ community. Many of the funds raised go toward the Wayne Jakino Educational Scholarship that is awarded to members of the local community to pursue higher education at a college or university within Colorado. The rodeo has participants from community members that include all races, gender identities and sexual orientations – they simply love the rodeo. The final deadline to register will be on the opening night of the event, July 7 at the Jefferson County Fairgrounds. However, you are highly encouraged to register before then to avoid late fees. Saddle up and don’t get thrown out the back door!